These new checkout51 offers will go live at 12:00 AM on Thursday, 04/23 and expire at 11:59 PM on Wednesday, 04/29. Members must buy the products in the United States and submit the receipts while the offers are live. Salad mix, Any variety of pre-packaged salad greens. Excludes loose produce. Hidden Valley® Ranch Seasoning Mixes & Dips, Any flavor packet. 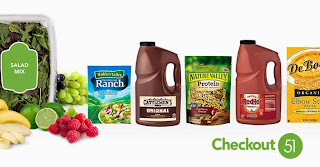 Excludes Hidden Valley® bottled dressings. Kiddylicious® Fruit and Veggie Crisps, Any variety. Hartz® UltraGuard Pro® Flea & Tick Drops, Any UltraGuard Pro® drop variety. Excludes all other Hartz® products. Combo: Arla Dofino® Cheese + Eureka! Bread, Any variety. Items must appear on the same receipt. DeBoles Pasta, Any variety. Items must appear on the same receipt. FRANK'S® RedHot® Sauce, Any variety. 1 gallon size only. CATTLEMEN'S® Barbecue Sauce, Any variety. 1 gallon size only. Ella's Kitchen® Nutritional Shakes 4 pack or larger, any variety. Ella's Kitchen® Coconut Water, Any variety.